Looks like a real friendly place here. I initially found this forum while looking around for signs of some tenchi audio CDs that I'm missing, but really enjoyed the atmosphere of the posts I saw. I wish I could say I'm an old fan of Tenchi Muyo, but in fact I'm a more recent fan having watched the original OVAs and Universe just a few years ago. I really fell in love with the series after listening through a number of the radio dramas, and that's why I've been collecting the CDs. Hope to make some good friends. Cheers! I was among the San Jose 1997 telecast, money well spent. 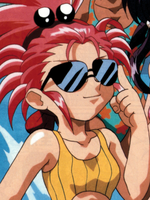 Then I got to see the rest of the Tenchi shows on Toonami in 2000 while on vacation, so it was a hotel cable quality.